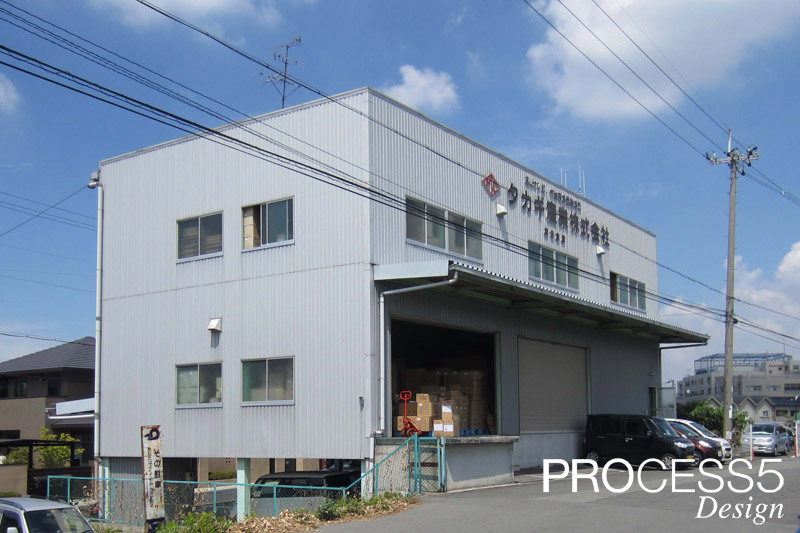 A relocation and renovation project of the head office of Takagi Industrial Co., Ltd., a company located in Sakai City, Osaka Prefecture, engaged in the planning and production of commercial-use food containers. 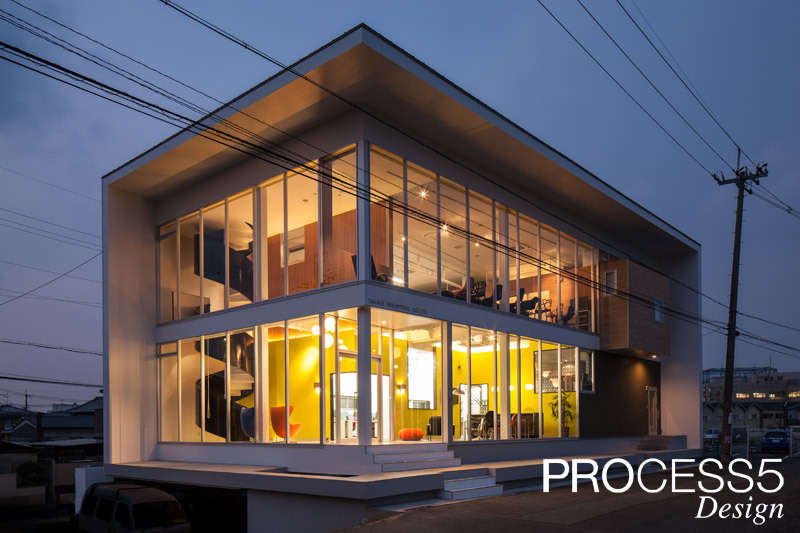 The project area is a warehouse architecture with 1 underground floor and 2 above ground floors which was formerly used as an independent distribution warehouse. 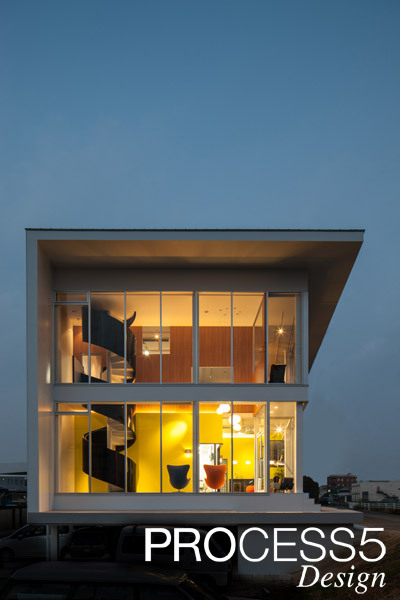 The location has a good view with a river flowing right in front of the architecture with 2 sides facing the road. Making the best use of this location, the project aims to create an independent office function, away from the present office environment in another area, in which the office is part of the distribution warehouse and production facility, a typical structure in the manufacturing industry. 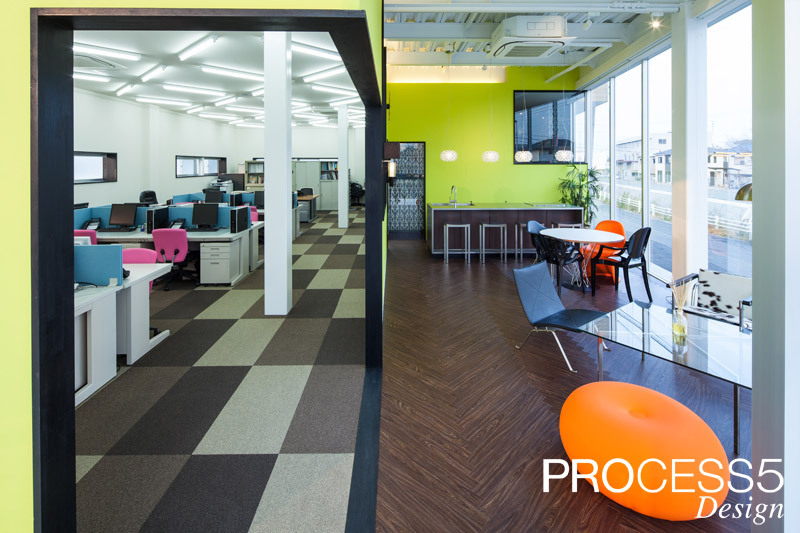 The requirement for the new head office is that it may represent the corporate image, providing an environment to welcome guests and a pleasant working environment for the staff. 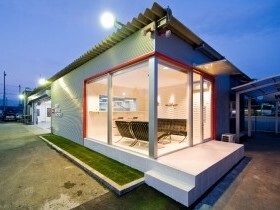 Thus, to reflect the feeling of expectation and elation that is experienced when opening the bento container planned and produced by Takagi Industrial, we have decided to open up the 2 external walls of the warehouse construction to the outside in order to present the working environment in a more beautiful and a more attractive manner. The 2 external walls will be glass with the corner as the entrance. 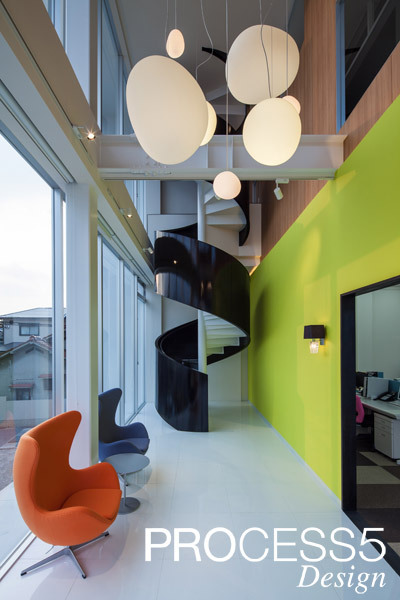 As one passes through the entrance, the spiral staircase to the second floor and the reception space with a counter become visible. During the daytime, this will be used as a meeting space with clients. 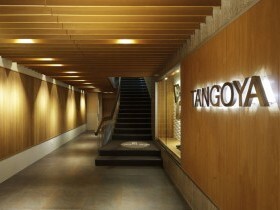 It can also be utilized as a community space to hold bento cooking classes using in-house products etc. When the sun sets, the space will become a relaxation lounge for the staff. The office space is situated in the back where the staff can be seen working. Behind the counter, one can catch a glimpse of the chairman’s office. 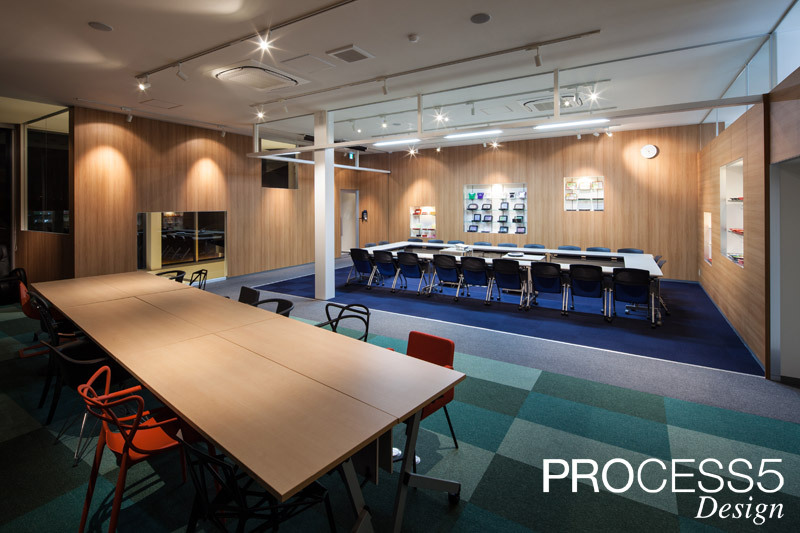 Going up to the second floor, there is a meeting space which can be divided with a movable partition. Not only the morning meeting and small meetings can be held here, but large- scale meetings can also be held in which staff from sales offices nationwide gather together several times a year. 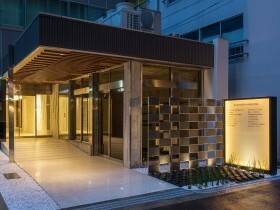 In the rest space, the entire staff can gather around the table to enjoy their bento lunch, and from the wide opening, they can enjoy seasonal delights such as cherry blossoms in the spring, and fresh green and fireworks in the summer. Depending on the work situation and content, we’ve created an atmosphere so that the staff working here can change from one style to another, fostering an environment conducive to communication. 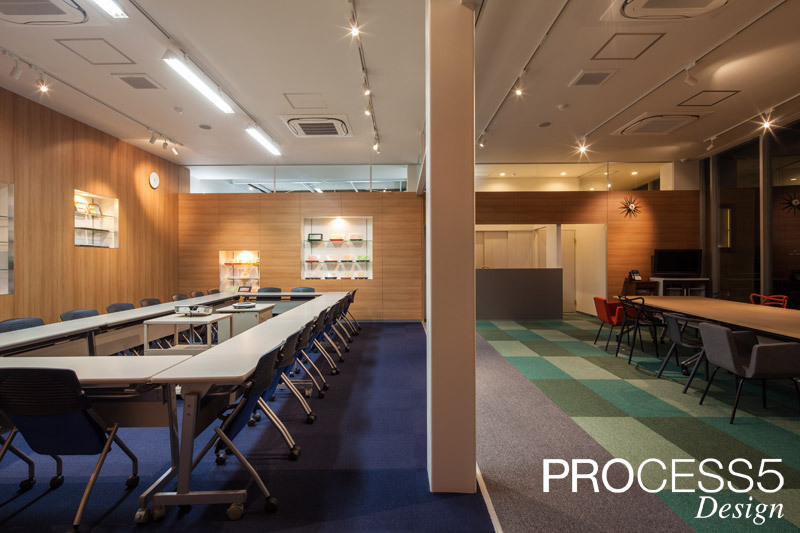 Our aim is to create a new head office in which the vivacious work atmosphere of the staff can be conveyed to the local community, as the colorful bento items decorate the box lunch planned and produced by Takagi Industrial. Through this project, new relationships will be cultivated, making Takagi Industrial a company which expresses to people the appealing nature of food culture.